Supported Internship student Owen Holtham has been at his placement with the Convent School, Shrewsbury since November 2018. 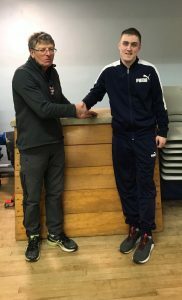 Owen works with a variety of pupils ranging from 5 – 11 years of age where he assists the Multi Sports Coach Mr York with a variety of sporting activities including table tennis and Football. Owen has been supported by Enable Job Coaches, Meg and Jez, who have been establishing Owens work structure and routine to enable him to feel confident to sign in and seek the lesson guidance from Mr York. Owen has been building his confidence when it comes to communicating with the teaching staff in the school and they have noted how much more relaxed and comfortable he seems in the school environment. Owen really enjoys helping the pupils and they are very happy to see him every week when he arrives. Owen is hoping that he can continue to gain the extra confidence and communication skills as he moves towards the summer term.